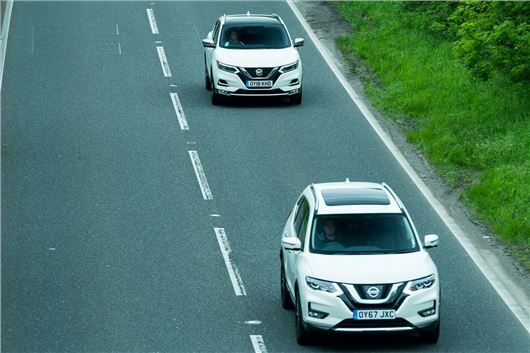 ProPILOT Level 3 autonomous driving technology, is now available in the Nissan Qashqai, Britain’s most popular ‘crossover’. Level 3 Autonomy combines ‘Lane Keep Assist’, ‘Intelligent Lane Intervention’, ‘Intelligent Cruise Control’ and ‘Traffic Jam Pilot’. These types of systems have been in development now for a long time. We first drove them in a Honda Legend in 2006. The car could automatically keep to its lane, cruise at a selected speed and slow down or stop according to the behaviour of the traffic in front. All with no intervention from the driver. However, the legal question then arose as to who was driving the car: the driver or Honda. And that’s where the requirement came from for the driver not to release the wheel for more than 10 seconds. Honda nevertheless applied its intelligent cruise control to the 2006 CR-V and ICC is now so widespread that most of us are familiar with it. But autonomy has moved on. Unlike many systems, Nissan’s Pro Pilot stiffens the steering feel so the driver can relax while the car takes over. If it senses the driver’s hands slipping from the wheel, it wakes him up with warning sounds. It’s switched on or off by a button on the right hand side of the steering wheel, grouped with the cruise control buttons so everything is accessible in the same place. A TFT screen between the speedo and the rev counter tells the driver exactly what has been selected and what the system is doing. The driver has to signal to overtake and, freed from the obstruction of the car in front, unlike other systems, Pro Pilot then accelerates hard to its pre-selected cruising speed. If the traffic in front comes to a standstill, Pro Pilot automatically brakes the car and, after 3 seconds, stop start switches off the engine. If the car in front then starts moving, Pro Pilot starts its engine again and follows at the pre-selected distance. Usually I find autonomous systems unpleasant, intrusive and sometimes downright frightening. But Pro Pilot seems to have overcome my misgivings. The stiff feel to the steering holds the car straight and keeps it precisely between the road markings on bends. The auto acceleration to overtake means it doesn’t bog down. And the ‘Traffic Jam Pilot’ works brilliantly to relieve stop-start stress. The Nissan Qashqai 1.6 DCi 130 Xtronic Pilot One Edition SV comes with the full suite of Pro Pilot Stage 3 autonomous driving tech for £33,425. ProPILOT is a £795 option on Tekna and Tekna+ Xtronics. But...the system is dependent on the driver knowing when is best to deploy it. The driver has to sit there, hands on wheel, whilst it 'drives' within it's limitations. I don't full understand the description of the automonous overtaking sequence either. Why is the car accelerating hard? Traffic Jam assist is certainly something I'd appreciate a time, but that is simply low speed adaptive cruise control. The only difference I see between this and my Hyundai Ioniq is that the adaptive cruise will switch off below 10 kph in the Ioniq. Hardly a revolution. Would not be better for the driver to just drive the car if you want to be driven about get the bus. I doubt if these systems can deal with the need to avoid the large pot holes and road debris that we have on our roads. In response to Sulphur Man, with all the other active cruise control systems I've driven the car slows down to the speed of the car in front but then, when I pull out to pass it is very sluggish to pick its speed back up to the pre-selected cruising speed. Obviously you can avoid this by staying in the outside lane all the time so you don't have to pull out into higher speed traffic to overtake. But I'm more courteous than that. If other drivers want to drive more quickly than I do, I try not to get in their way.